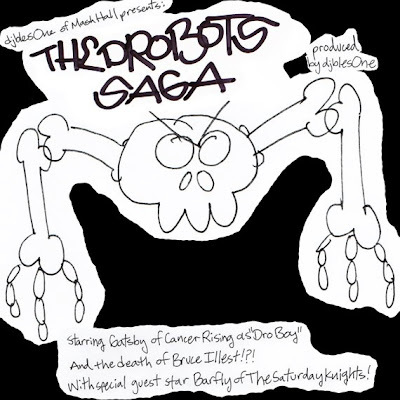 I just came across a project album comprised of Bruce Illest (djblesOne) of Massive Monkees/Mash Hall and Gatsby of Cancer Rising who takes on the moniker of Dro Boy. Sh!t is ridiculously ridiculous. Naw, not even ridiculously ridiculous, sh!t is bananas on some narrative type journey to space and beyond, yet it's still grounded and not too far out. Ya dig?! If not, just take a listen and then you'll understand what I'm talkin 'bout. along the way...GUEST STARRING BARFLY OF THE SATURDAY KNIGHTS!! !